Atlanta offers several ways to celebrate Friendsgiving and relax before the holiday rush sets in – without those awkward family conversations. 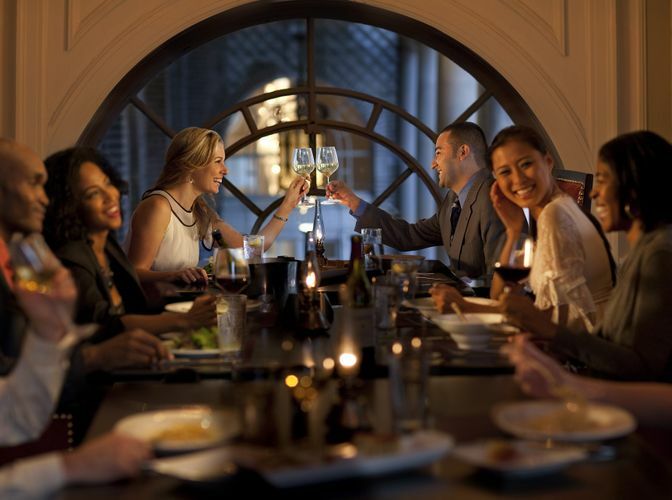 Whether looking for a casual outing or an upscale dining out, these restaurants serve the ideal meal to enjoy with friends. Gunshow boasts an a la carte, rotating menu based on the concept of Brazilian churrascaria and Chinese dim sum. In-house chefs prepare and present their dishes – along with a story or an explanation of their inspiration – to diners via rolling carts and passed trays. One-of-a-kind dishes offer the opportunity to try and share several gourmet plates with fellow foodies all in one place. Kevin Gillespie’s open kitchen and lively dining room create a fun atmosphere to experience, landing him a spot as a James Beard Best Chef semifinalist in 2017. Friendsgiving dinner doesn’t have to consist of turkey and dressing with options like Varuni Napoli. Long tables wait to serve traditional Italian panzerotti – fried potato croquettes, slices of oro bianco pizza and calzones. Varuni’s wood fired ovens put a crispy finish on pies topped with buffalo mozzarella, hot soppressata and cherry tomatoes. Friends may choose to craft their own pies or split a white- or red-based pizza with the table. Nutella calzones and tiramisu replace traditional pumpkin pie to end the meal. Enjoying a meal at Mary Mac’s, one of Atlanta’s last remaining tea rooms, feels just like sitting around the table at Grandma and Grandpa’s house. The tea room’s holiday dine-in menu features Southern classics such as made-from-scratch pimento cheese, smoked corncob ham and sweet potato soufflé. For larger crowds, diners chow down on family-style, “meat and three” choices with fried chicken, collard greens and Georgia peach cobbler. The restaurant’s seven classically-decorated dining rooms accommodate Friendsgiving groups big or small. For those looking to enjoy the meal in the comfort of home, holiday pick up is the way to go. While a bustling food hall may not seem like a typical spot to share an intimate meal with friends, Ponce City Market’s food stalls offer global cuisine and lets everyone order what they want. Bao buns from Simply Seoul Kitchen fulfill Korean cravings, El Super Pan transports diners south of the border and Farm to Ladle serves sandwiches, soups and salads made with locally-sourced ingredients. If that doesn’t sound enticing, one of the five options opened by James Beard Award-winning chefs serves meals to please. After tucking in, Skyline Park on the roof houses a two-story slide, classic arcade games and putt-putt for a way to burn off that extra energy before an afternoon nap.